Being 2019, the time has come to enter the mobile age and read comics on tiny screens. 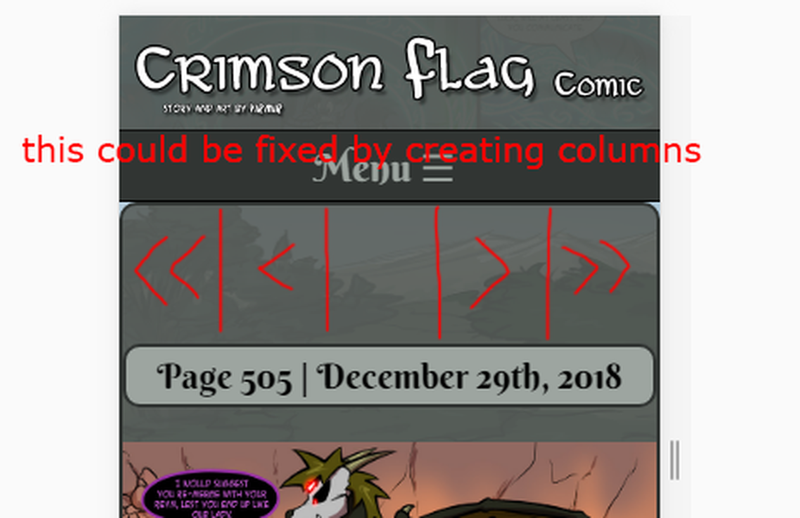 Please feel free to take a look on your tiny phones and let me know if anything looks too terrible (you may need to refresh your browser caches first). I haven't touched the chat yet-- I'll give that another look from a mobile perspective soon. Hey Virmir, nice update to the site. The menu and footer both appear to be fully functional, I've only noticed two bugs other than that. 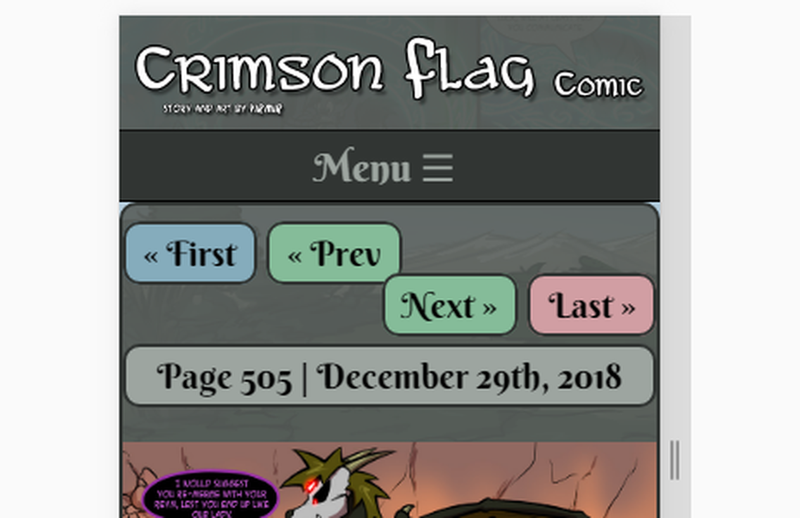 The first bug is when the page is small enough to go into mobile mode but the comic won't go wider than 800px. The next I found on my phone. The buttons solution would also increase the button area for mobile users. Thanks! Thanks for reporting! What phone/browser are you using? I'll make some more tweaks this weekend. Thanks for updating it Virmir! You are a gray fox of many talents. Chrome and Firefox on my computer, and Chrome on my phone. These should be fixed! Let me know if you spot anything else. You never really seem too hesitant to quickly patch up some individual bug on your site. 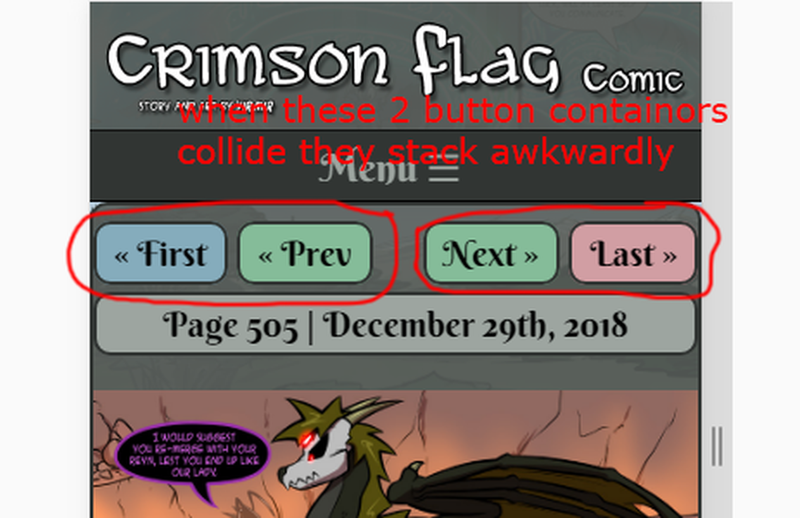 Nothing wrong with that really, but the button stacking bug still persists. Which is why I made this little code snippet you can replace everything past line 733 with that, yes, should fix everything up to this point. 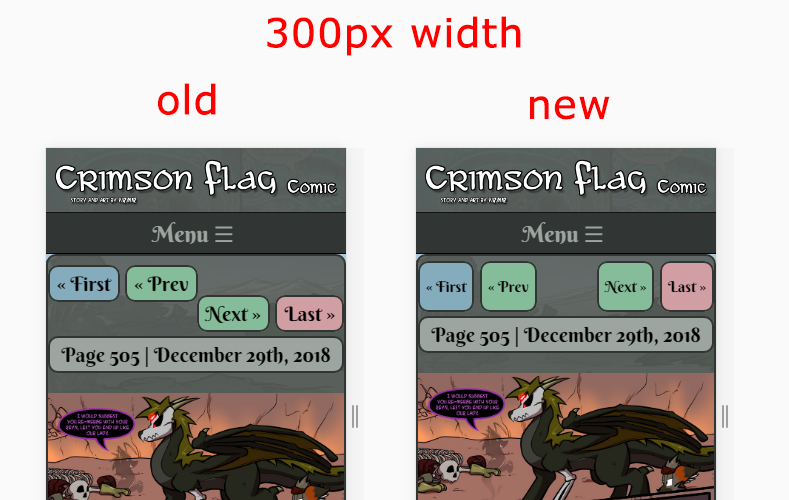 What are you using that has a screen width of 300px wide? My phone is pretty close at 320px, but maybe I'm a little too cautious, heh. I would just like to give a shout out to Virmir here for working on all the little technical issues that come up on the site! You're a very technically gifted and responsible administrator, Virmir, and you take the functionality of this site very seriously! Thanks!